Frankel is no stranger to talented progeny. With the average sales price being £500,000 you don't get much change when putting your hand in your pocket. As a wise horse breeder once said: ''Every horse has its story to tell.'' That is true of horses bred by this super stallion. In truth, the majority of owners lucky enough to be able to afford such thoroughbreds have visions of Classic race success. Perhaps the 2000 Guineas. Epsom Derby. Whatever their expectations, very few owners dream of limitation. It's interesting to consider that one of Frankel's offspring will take a different course and find himself heading to the Cheltenham Festival 2018. There is one candidate who could well hit the headlines or gain a few sound bites. Solo Saxophone is a son of Frankel out of an American-bred mare called Society Hostess. This bay colt is owned by BGC Racing and trained by Dan Skelton. This home bred came from Moyglare Stud Farm but sold at three for 62,000 euros. He was probably a slow maturing type because Solo Saxophone didn't make his debut until three when trained by Dermot Weld. 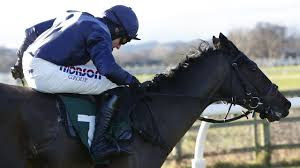 He was pretty fancied in the betting on all five starts at three with a couple of second places and a close third when losing at Tipperary by less than one length. His final start at three so him visit Gowran Park when finishing down the field when seventh of sixteen at odds of 6/1. Solo Saxophone found the winning way when making his debut in a juvenile hurdle at Catterick where he won ''going away'' at 6/4f. Stepping up to two miles at Wetherby, he led towards the finish to win by half a length at 5/4f. Most recent, he stepped up in class and distance [2 mile 1f ] when visiting Exeter taking on four rivals in a listed race worth £14,237.50. The bookies had him priced at 12/1 drifting from 9/1. This April foal finished tailed off in third place behind the two favourites and very impressive winner Vision Des Flos, trained by Colin Tizzard. Solo Saxophone has a couple of entries for the Cheltenham Festival. Which Frankel Offspring Has Shown the Most Promise? Frankel to Sire Grand National Winner?